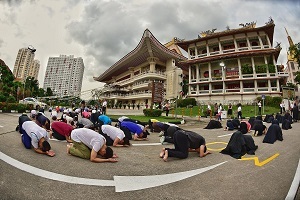 Singapore -- The Singapore Buddhist Federation and other experts are encouraging devotees to not release animals to mark Vesak Day, but to consider alternatives instead, including going vegetarian. Buddhist groups have been educating followers on the issues associated with releasing animals, but in the lead-up to Vesak Day today, the groups say followers need to be reminded. Venerable You Wei, chairman of the Buddhist federation's education committee, said: "It will be ironic to consume meat and liberate life." The 42-year-old added: "Vegetarianism saves many more animal lives than life liberation." The practice of releasing animals on Vesak Day and on other special occasions is known as "fangsheng" among Chinese Buddhists, and "jiwitte dana" (the gift of life) among Theravada Buddhists, said Dr Neena Mahadev, an anthropology professor at Yale-NUS College. Dr Mahadev, who specialises in the study of religion, said Singaporean Buddhists "tend to be mindful of the broader ecosystem and are educating themselves on which animals are appropriate for release, and which will survive in the wild". Mr Chan Chow Wah, a researcher of Buddhism who is a fellow of the Royal Anthropological Institute in Britain, said: "Animal release if done in the right context is not an issue, for example, releasing a captured wild animal to its original habitat." But it is not appropriate in Singapore. "In urban places like Singapore where animals for sale are bred in captivity, releasing these animals causes suffering as they are unable to survive when they are released," added the 45-year-old, who is a Buddhist himself. Other than adopting a vegetarian or vegan lifestyle, Mr Chan said Buddhists can rescue animals and support animal shelters - activities that take place all year round in the Singapore Buddhist community. More Buddhist followers are aware of how releasing animals also jeopardises the environment. Dr Tan Wee Hin, a biological science professor at the National University of Singapore, said: "Introducing animals such as red-eared terrapins and fish can change the environment, such as the quality of water, to become harmful to other species and increase the competition for limited resources." The National Parks Board (NParks) has been working with volunteers to spread awareness via exhibitions, roadshows and school outreach activities. NParks volunteers also have been looking out for animal release in nature reserves and parks. Those caught releasing animals can be fined up to $50,000, jailed for up to six months, or a combination of both.